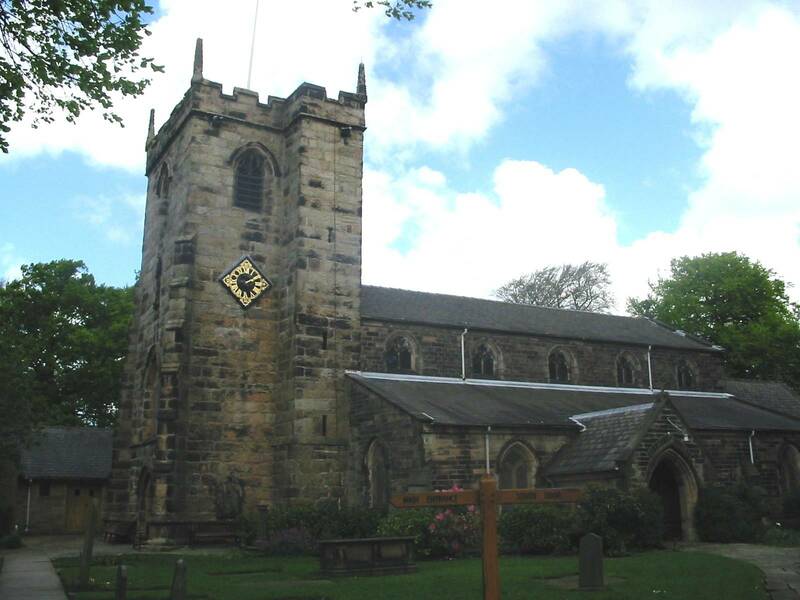 Saint Mary's church in Penwortham dates back many centuries and was once visited by Oliver Cromwell who came here around the time of the Battle of Preston (1648). The church is in the Blackburn Church of England Diocese and also a member of the Preston Branch of the Lancashire Association of Change Ringers. The church can be found on Church Avenue, off Kingsway & Hollinhurst Drive, just off the A59 Liverpool Road. The OS Grid Reference for the church is SD523290. Treble (1)	 2 3 21 A M & S LONDON. REV: T. J. CUNNINGHAM. GAVE THIS BELL IN MEMORY OF HIS BELOVED WIFE ADA CUNNINGHAM 1926. (2)	 3 0 10 G# M & S LONDON. LIEUT: COL. J. Y. FOSTER GAVE THIS BELL IN MEMORY OF HIS BELOVED WIFE ELISABETH STEUAT FOSTER 1926. (3)	 3 1 23 F# TAYLOR AND SON LOBOR 1858. RECAST BY MEARS & STAINBANK LONDON AT MARY RAWSTONES COST 1891. (4)	 4 0 12 E GOD SAVE QUEEN ANN A [bell] R 1712. (5)	 4 3 16 D PROSPERITY TO THE CHURCH OF ENGLAND 1712. THIS BELL WAS RECAST AT THE COST OF W. S. RAWKINS ESQ. IN MEMORY OF HIS MOTHER ELIZA REGENT RAWKINS 1926. (6)	 5 0 9 C# ABR: RUDHALL CAST US ALL ANNO DOM 1712. (7)	 6 3 5 B RALPH LOXAM MINISTER A [bell] R 1712. Tenor (8)	 8 2 6 A WM: SLATER EVAN MAUDSLEY WM FARINGTON WM BICKERSTEFF WARDENS 1712. [Whitechapel mark] MEARS, LONDON. All of the above bells were recast by Mears and Stainbank (London) in 1965. 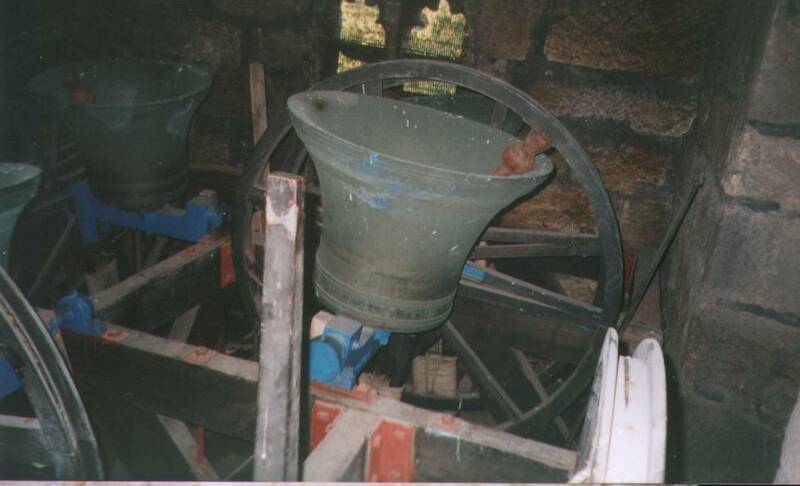 The photograph below shows some of the bells in the tower at Saint Mary's. In the foreground, the stay of the treble and wheel of the second are visible. The sixth is in the background of the photograph, on the left. The tenor bell is closest to the camera and the seventh is hidden behind it. 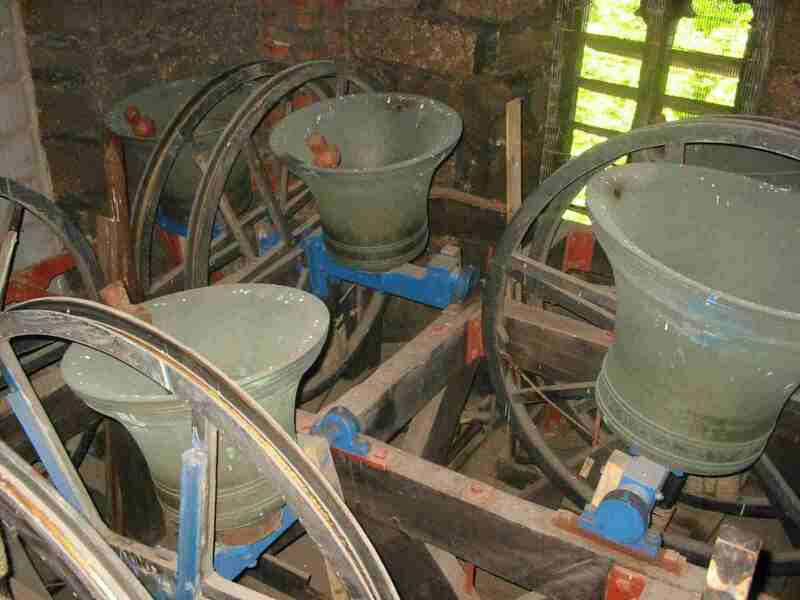 The photograph above also shows some of the bells in the tower at Saint Mary's. In the foreground, third is visible. The fifth, sixth, tenor and seventh can be seen in varying degrees of clarity in the background.